View our diamond engagement rings with side diamonds here. Diamond engagement rings are what most women expect and count on when the big question is finally asked. Some women start dreaming about their engagement ring when they are young and they continue to dream about it until they finally get a real diamond ring. That is just another reason why you should choose the perfect engagement ring for the love of your life. There are many different styles of diamond engagement rings with side diamonds. Some women prefer a ring with only one central stone and others like to have many side diamonds to accent the focal point of the ring. Finding out the tastes of your future bride is essential. If you want the ring to be perfect, you have to know what she likes and what she does not like. You should be able to find the answers to these questions by asking her friends and family and by taking note of what she wears. One of the finest places to find side stone engagement rings is at Novori. 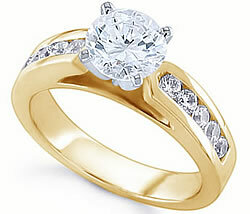 This online jewelry store has a wide selection of different engagement rings with side stones and without. These engagement rings are fabulous and your future life partner is sure to fall in love with whatever ring you pick from Novori. At Novori, you will be able to find the most divine diamond engagement rings with side stones in gold, white gold or platinum. The side stones in Novori rings add to the brilliance of every single engagement ring. Engagement rings are elegant and classic with their different shaped stones. You can choose the shape of the diamond that you want in your ring. Round center stones are always a favorite. Add to princess cut side stones and round side stones accents and you will not believe your eyes. No matter what your budget may be you will be able to find the perfect diamond engagement ring with side stones. You can search Novori for all of your wedding jewelry needs. We have a database of over 30 000 diamonds in yellow gold, white gold and platinum settings. If you are just not able to find the right diamond engagement ring with side stones you can choose to design your own. This will allow you to choose each element of the ring so that it is perfectly customized for your bride to be. This is a wonderful option for everyone. It is a fantastic way to put some more thought into your side stone engagement ring purchase.